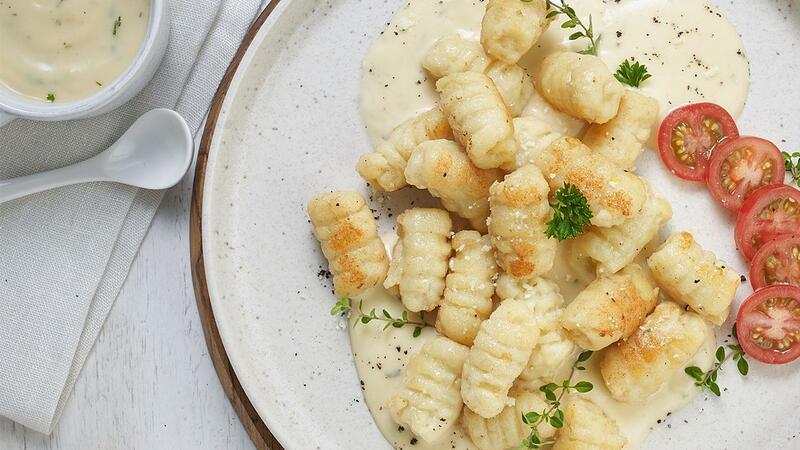 Soft texture of gnocchi blends perfectly with a thick and savoury cheese sauce. With the basic flavour of Knorr Potato Flakes, this simple dish by Chef Deden will be a lovable unique menu for the diners. Prepare the pot over medium heat, add boiled water and Knorr Potato Flakes. Add the Segitiga Flour little by little while continuously stirring to mix the dough evenly until the flour runs out. Add egg, ricotta cheese and parmesan powder while stirring constantly. Finally, add olive oil and continue stirring till doesn't stick to the pot, lift from the fire, set aside. Make small balls, using a fork, add a little motif to the surface of the gnocchi being made, make a shape like for gnocchi. Boil water in another large pot, add salt and oil. Put the pieces of gnocchi into boiling water. Lift, store in container that already given olive oil. The same ingredients and cooking method as Knorr recommended. Cherry tomatoes, thinly sliced. Parsley leaves, finely chopped for decoration.